If a [landowner leases] an arable field to a(nother) man for cultivation, but he did not cultivate it, turning it into wasteland, [the penalty is a payment of] three kur of barley per iku of field. The case [of three accused murderers and one accused accessory] was brought to [the city of] Isin before the king, and King Ur-Ninurta ordered their case to be taken up in the Assembly of Nippur. 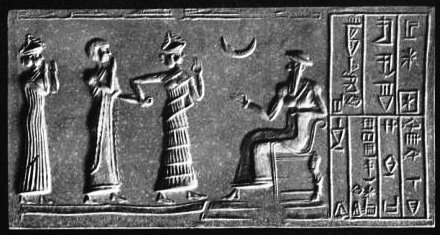 -"The Silent Wife," case from ancient Sumeria reported in a clay tablet 19th century BCE; this is the earliest known case of a change of venue in human history. If a man without authorization bound another man to a matter of which he (the latter) had no knowledge, that man is not affirmed (i.e., legally obligated); he (the first man) shall bear the penalty in regard to the matter to which he had bound him. -Code of Hammurabi, mid 18th century BCE, establishing a rather harsh standard of judicial review. For further information, see, e.g., Marc Van De Mieroop, A History of the Ancient Near East ca. 3000 - 323 BC (Blackwell 2006); Russ Versteeg, Early Mesopotamian Law (Carolina Academic Press, 2000); Brian Gottesman, "The Silent Wife," In Re: The Journal of the Delaware State Bar Association (November 2006). Image: "Cylinder-seal of Khashkhamer, vassal of the king of Ur (c. 2400 BC) (British Museum)." Donald A. Mackenzie, Myths of Babylonia and Assyria (Messrs. Mansell & Co. 1915), p. 50.